A favourite stopover on the Spectacular South Africa tour with Lekker Adventures is Oudsthoorn. 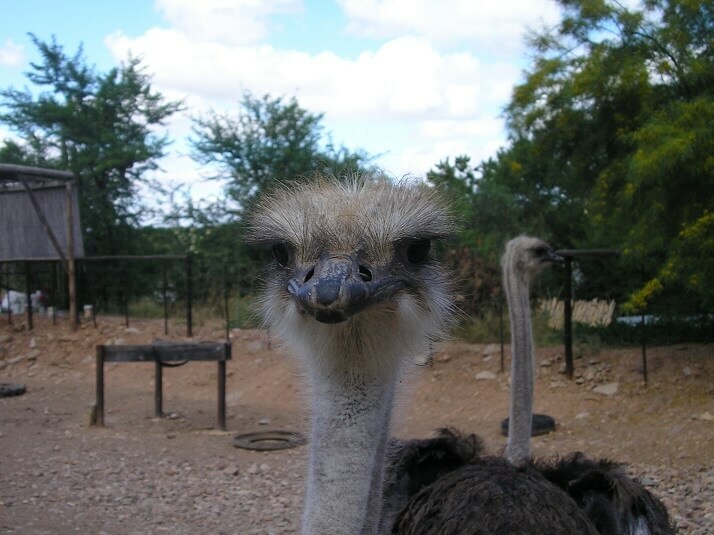 Situated in the Klein (Little) Karoo, it is known as the “ostrich capital of the world”. These gawky, odd birds pretty much rule the roost. Oudtshoorn has ‘thrived and dived’ since the 1800s when the first ostrich-feather boom brought farmers to the area. The ostrich industry has been struggling in recent years but the town people have dug deep and found other ways to survive and attract tourists to the region. The area was originally inhabited by Bushmen. Many rock paintings found in caves throughout the surrounding Swartberg Mountains tell a story of the life they led all those years ago. The first European explorers to the area were a trading party who were led there by a Griqua (local inhabitant) via an ancient elephant trail in 1689. They made it as far as a town known today as Aberdeen but left the Klein Karoo after eight months. A hundred years later the first European farmers settled in the region. The settlement grew around a large Dutch Reformed Church and Oudtshoorn was officially founded in 1847. It was named after Baron Pieter van Rheede van Oudtshoorn, who was appointed Governor of the Dutch Cape Colony in 1772. The baron died at sea on his return voyage to the Cape. The Klein Karoo is an arid region and the scarcity of water was a problem in those early days. Water was transported to Oudsthoorn in barrels and sold to the townsfolk. Poor rainfall and difficult farming conditions led to the use of the earliest irrigation systems. Fruit and grain were produced in large quantities but tobacco and ostrich farming was the main activity. Ostrich feathers were highly fashionable at that time and many farmers prospered from farming ostriches. However, severe droughts, floods and global recessions have taken their toll on the ostrich industry since the early settlers arrived in Oudsthoorn and even today ostrich farming is a labour of love. This is where you’ll spend a fun-filled morning interacting with ostriches, learning about them, riding or racing one and ultimately dining on one. The ostrich show farms are active breeding farms that open their doors to tourists. Ostrich tours bring in much-needed revenue for the farm which helps keep it running. No holiday to South Africa should end before you’ve sat on the back of an ostrich. A highlight of an ostrich tour is watching the professional jockeys tearing around a race track with massive grins on their faces. Ostrich obviously features on the menus of the farm restaurants. Enjoy true Karoo hospitality at its very best. Ostriches have been roaming this planet for the past 20-60 million years, although they were originally found around the Mediterranean Sea, and in China and Mongolia. They joined the migration trek about a million years ago and eventually made their way to Africa. These big birds have no teeth and pick up gizzard stones to help with their digestion. These stones and pebbles often weigh up to 1.5kgs. Without these gizzard stones, the ostrich would die. In the wild, an ostrich lifespan is 35-45 years. But living in comfort at a show farm, they live much longer. An ostrich on one of these farms lived to the ripe old age of 81 years. Watch out for an ostriches big toenails. They are the only bird in the world with two toes. They are lethal fighting tools and a kick from an ostrich can be fatal. If you find yourself face-to-face with an angry mama, drop onto your stomach and cover your head. They get bored easily and will move on. If you raced a cheetah against an ostrich, the cheetah would only just take the winning medal. Ostriches can reach a speed of 70km/h on an ordinary day but put the wind beneath their wings and they’ll clock in at 97km/h. The cheetah on a good day clocks in at 112-120km/h. Ostriches are delightful to watch especially when it’s time to call on the ladies. The males perform an elaborate mating ritual that involves him crouching, flapping his wings, arching his head and tapping his back side to side. Don’t know what the lady ostriches think of it but it’s great fun to watch? My, what big eyes they have and all the better to see you with. Ostriches have exceptionally good eyesight which isn’t surprising considering its eye takes up two-thirds of the volume of its head. Imagine carrying around two big eyes that weigh about 60kg/eye. On the flip side, the brain of an ostrich is exceptionally small. It’s about the size of a hen’s egg, which weighs about 40g. The ostrich has no vocal chords and the adult female only produces a hissing sound when excited. The male booms and grunts during mating season which sounds a lot like the far-off grunt of a lion. Funny enough, young chicks make a chirping sound from birth but become voiceless after about 2 months. Ostrich meat is a healthy alternative to other meat products because it’s low in fat and cholesterol. It has 40% less fat than beef and is also lower in fat than skinless chicken. Ostrich meat is high in protein and iron which is why it’s so popular among sportsmen. Not everyone likes the taste of ostrich because it is so high in protein and iron but it’s definitely worth a try. It’s also pretty easy to prepare. South Africans love it on a braai or as potjiekos but it is also delicious cooked like steak on a grill.